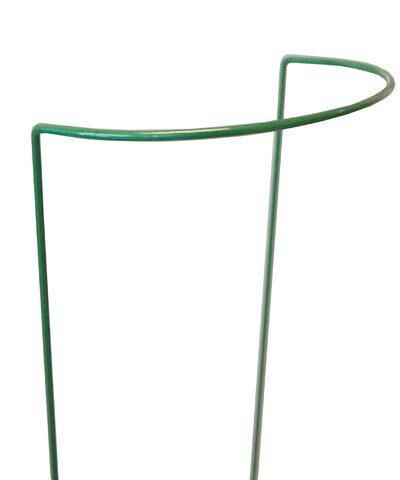 Aid your plants as they grow with the Gardman Semi-Round Plant Support. Placing a support next to your small flower or herb as it grows helps distribute its weight, directing the stem upward rather than outward for a healthy root system. The 6" diameter, top semicircle surrounds half of a flower or small shrub, and the two, 18" long legs insert into soil in moments. The plastic coated steel remains durable for many seasons, and its green color meshes with your plants. Use two of these supports to surround a plant, or several in a row to create a border. Help your flowers grow upward and strong with this Semi-Round Plant Support. Note: This case pack includes 50 of the Gardman Semi-Round Plant Supports, 6" x 18".